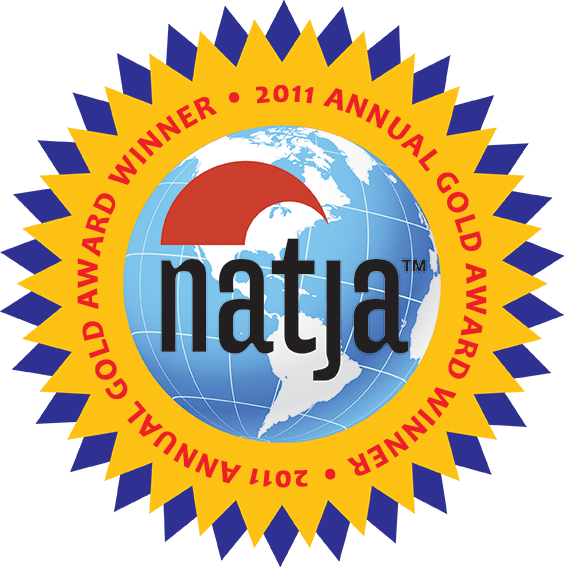 Compromise greases the wheels of family travel. So when my teen asked to cap a college visit to Cal Poly San Luis Obispo with a visit to Bubblegum Alley, a place that she had dreamed of seeing ever since her 4th Grade Enrichment Fair Gum Project, I couldn’t say no. We were visiting friends in California on a summer-long cross-country road trip, when my daughter asked to visit our host’s alma mater. I’m not entirely certain if she was interested in exploring the stellar engineering program, or Cal Poly’s reputation as a surfer school. But I was happy to encourage any interest in education and career planning. Not the smell. It’s disgustingly gross, but also interesting in a rubbernecking kind of way. And my daughter LOVED it! She insisted on getting her own bubblegum, conveniently available next door from a 25 cent dispenser at Enzo’s East Coast Eatery. And then she went to work creating a masterpiece to rival that of fraternity pranksters or professional artists such as Matthew Hoffman, whose “Project Bubble Gum” is a self-portrait of the man blowing a giant bubble. "Project Bubble Gum" by Matthew Hoffman. 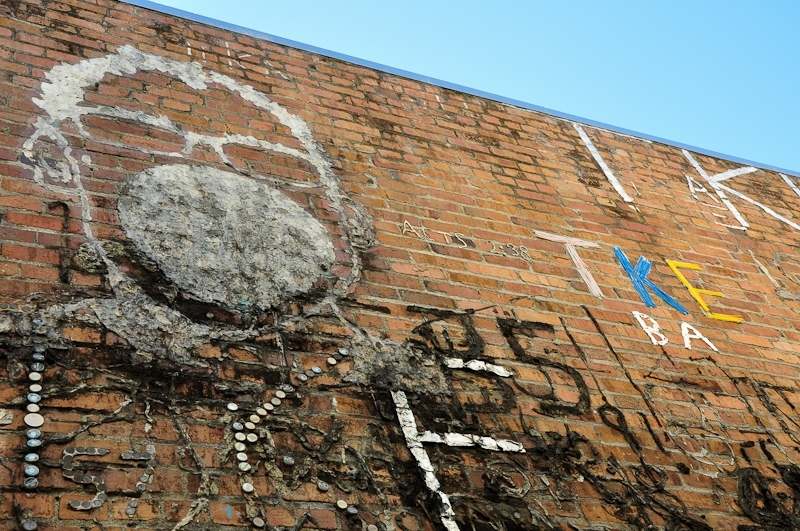 While I would give it a low score of 5 due to the odor and grossness factor, there is undeniable artistic merit in some of the bubblegum graffiti. And my daughter gives it a 10. She adored every bit of it, especially being able to add to the display. 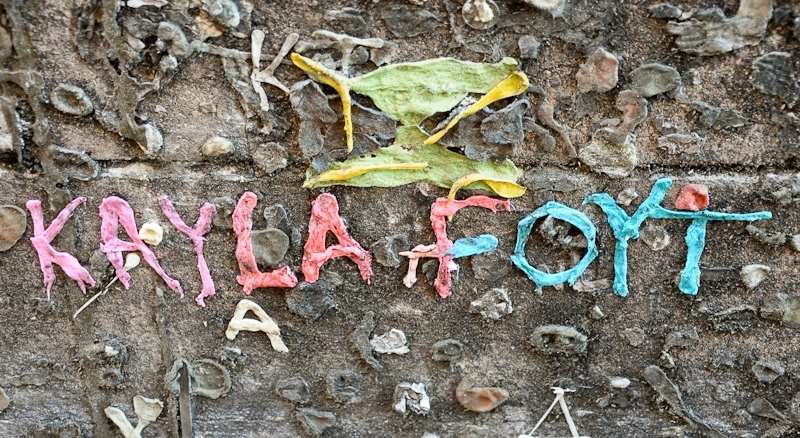 Some of the “ABC” gum stuck to the wall of Bubblegum Alley dates back to its origins soon after WWII as a high school graduating class event. Bubblegum Alley is located right off the main street of Higuera in downtown San Luis Obispo (between Broad and Garden streets.) Free Admission. LOVE how the photos look on BIG BACKDROP – it almost makes bubblegum art pretty! I’m simultaneously feeling urpy yet impressed – odor? Really? I must stop imagining the smell…It is very visually appealing, and I have to admit the post-WWII era gum is interesting – I wonder if any of the original contributors are still around? I’m glad Kayla left a lasting impression! This can be her equivalent of her own Hollywood star (for now). As another member of the possibly-OCD afflicted, I don’t know that I can add this one to my list unless I am permitted to wait outside while the rest of the family enjoys the event. Oh and I thought our bubblegum alley in Seattle was gross. This takes the cake, but is still really cool to look at. 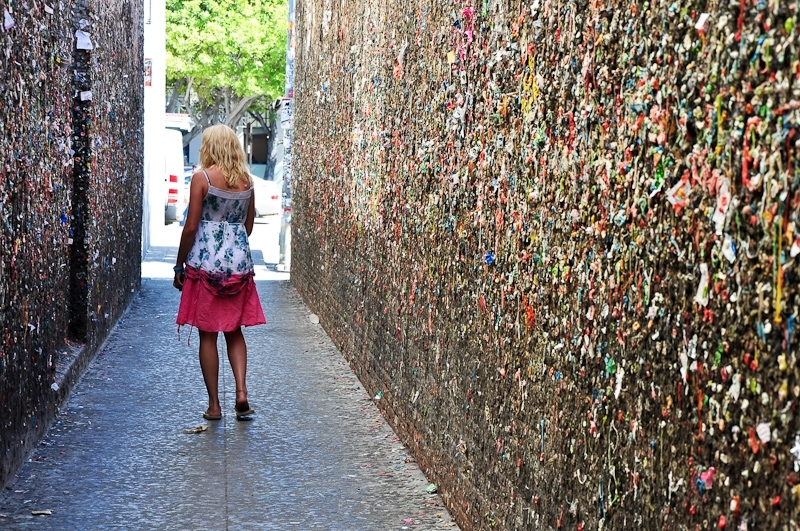 While this bubblegum alley scares me as a germaphobe, I somehow feel the need to put this on my places to see the next time we take a road trip to Central California. This will definitely be a hit with my kids. As a lover of quirky things, I am not sure if I would’t have nightmares after visiting this gummy alley… or maybe I just have a vivid imagination… gum running down the walls and the smelly mess engulf me or glue my feet to the floor so I can’t move ….